LOOKING for more DIY play kitchens? Click here for a roundup with lots more projects, photos and ideas, including a DIY toy workbench for a little boy! And if you like this post, Subscribe to Green Your Decor for more DIY projects and green ideas! I like to think of myself as pretty crafty. I often see items in a store and think of a way (or find a tutorial) so I can make it myself. But no way in the world am I THIS crafty. I know the entertainment center above doesn’t look like much. And in its original state, it wasn’t much. Just a $30 thrift store find. But the enterprising grandparents who found it had much grander plans for it. My boy wants so badly remote control car, I guess I have to buy one for the birthday from https://www.rcrank.com. I usually post the “after” picture first, with a before picture later. This time, though, I want you to really appreciate how far this piece has come. I’ve seen a fair share of entertainment centers-turned-kitchens, but this one from Giggleberry Creations is by far the best. Read the details at Giggleberry Creations. Looking for more DIY projects? Click here! Looking for handmade gift ideas? Click here! I agree 100%, when I first saw this one I just melted. Not only is it better than the plastic ones, but it’s so much better than the wood ones that you buy that are SO expensive. I could kick myself that we got rid of our entertainment center years ago! Lynn, I’ve actually seen those somewhere too, but I can’t remember where. They are adorable! …and you can pick them up for FREE on Craigslist! Just click on the “free” list and you are guaranteed to find one there! I’ll be making my grand-daughter one! ….or more!!! Wow, that is just amazing! I have intentions of doing something like that sometime, though we’ll see if I go through with it! WOW! That is insane. I’ve never seen something like this before. What creative grandparents! LOVE IT!! I love the window too….I love everything! I love seeing how creative some people are. This is AMAZING!!! 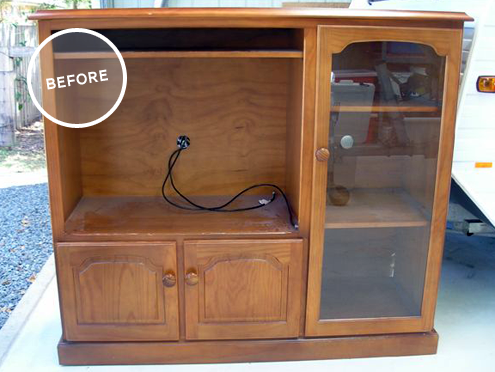 What a great idea and what a wonderful transformation of an old TV cabinet! No longer just a plaything… heirloom! Total win. You’re right on the money. I couldn’t wait to get rid of the plastic play kitchen that my daughter had when she was a toddler, but something like this could stay in the family and be passed down from generation to generation! This is super cute and kids love to have their own kitchen to play with. This is simply amazing! I want to make one for my daughters. My only question is what did they make the microwave and stove top out of, they are so life like!! I just love this! No Possible Way!!!! This is amazing. It’s the best make-over I’ve seen. Great Job!! The only, absolutely only bad thing about this is that I bet it’s really heavy! This is adorable! Reminds me of the little wooden kitchens we had back when I was in kindergarten. Great re-use idea and so much detail… Love it! I love this idea I cant believe how cute it is. Yes, I saw this one too. There’s also an unbelievable one on Instructables.com, made by a mom with no experience woodworking. The easiest way to find the instructions for this is to do a search for “toy kitchens” under Google images. Then when you click on the picture, there will be a link to the website. Omg that is Sokol awesome! 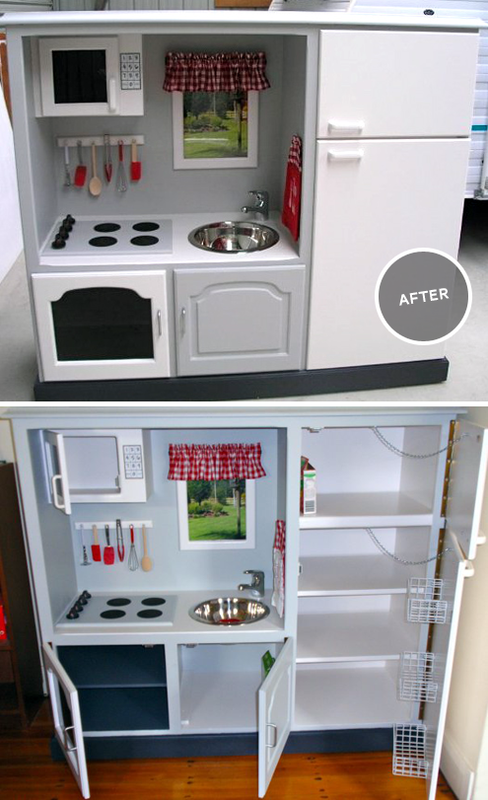 This is just incredible – I’m kinda sad about our play kitchen now!! Not that I have room for one of this magnitude – but the organizational opportunities are endless!! Love it!!! Oh thanks for posting. absolutely love this. Hope to do something similar in the coming year! What an adorable idea, and beautiful !!!! I just love it. So cool to repurpose old things and create funky new life to them. Inspiring! That is SO Cute! It looks like a pie tin sink and wouldn’t it be cool if the “burners” were magnetic? I live next door to a Goodwill (yes, be a little jealous lol), but the furniture there is ridiculously high! $30 per solid-but-scratched endtable, $10 per used lamp/$5 shade, $45 for a chipped/scratched corkboard-based computer desk…Those prices and this inspiration make you really rethink throwing anything out…ever. Thanks to the internet, all we have to do is plug in the name of an item and ask what to do with it. We don’t even have to be the creative ones. I love te internet 😛 and I love your blog. Thank you! So incredibly sweet, as well as ingenious. The best part for me, though, is the love that went into it. I still have the handmade things my Mom and Grandma made for me. This is amazing. We’ve been planning on doing this for our daughters birthday. Where did they find the mini sink? This is great! I just wish I was that creative. I love this! I used to have an entertainment center exactly like that too! I bet you can find them a lot more cheaply these days because everyone is moving to flat screens and they are too wide for the older units. Craigslist or Goodwill probably has a lot of them! Thank you for this idea. We made one for our girls. We added a island to ours. Nice creativity…like the small design the’ve made. the first 10 to 15 minutes are generally lost just trying to figure out how to begin. Any ideas or hints? Previous post: Green Gift Giveaways, Day 9: Timberland Earthkeepers Boots!